Alan Vincent is a very popular fellow. Alan started racing in 1966 with a 1952 Ford flathead V8 at Freetown Speedway a dirt track. This was the start of four decades of racing. In 1968 he switched to a 1950 Meteor, and he usually ended in the money. His next car was a 1957 Dodge. Alan stayed with the Chrysler products. In the early ’70’s when PEI’s stock car racing appeared to be doomed, Alan was determined not to let it die. 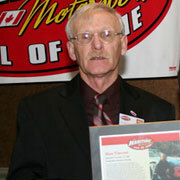 He persuaded the Borden Kinsmen Club to rent the Freetown Speedway in 1973. Alan worked day and night to get the track in shape, he joined the Kinsmen and proved to be one of the clubs best members. Alan would race at River Glade Speedway on Saturday night and head back to the Island to race Sunday. Alan was used to waving checker flags, sometimes 4 a night. Alan received the Most Sportsman Driver four times, he also won Fan Favorite Driver and Modified Championships. In 1992 he started racing on the MASCAR Tour with a Dodge Daytona with the ever visible # 28 on the doors. The next year he purchased a Chrysler LeBaron in Ontario that had been racing the CASCAR circuit, he raced it for 3 years. His next car he bought from Mike MacKenzie, put a 96 Dodge Avenger body on it and raced it until 1999. In the early ’70’s he tried his hand at Drag racing and gathered a few trophies for his collection.